It is late on this Thanksgiving Day. Our turkey has been devoured, our naps have been taken. We as a family have been blessed in innumerable ways this (and every) year. So many people have poured out love on us, and for that we are thankful. Jeremy and I try to focus some of our parenting energy on teaching our children to be a blessing in other people's lives (and also not to poop on the carpet). A few minutes ago, I bought the Bees their first Christmas present of the year. It was not the latest hundred-dollar electronic doodad. It was not Princess Bad Body Image Barbie. It wasn't anything they'll ever lay their hands on. It was a bunch of honeybees. From Uganda to El Salvador, bees from Heifer International help struggling families earn income through the sale of honey, beeswax and pollen. Beehives require almost no space and, once established, are inexpensive to maintain. As bees search for nectar, they pollinate plants. Placed strategically, beehives can as much as double some fruit and vegetable yields. In this way, a beehive can be a boost to a whole village. 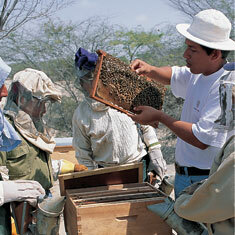 Although most Heifer partners keep bees as a supplement to family income, beekeeping can be a family's livelihood. Your gift can help Heifer provide a family with a package of bees, the box and hive, plus training in beekeeping - and this unique gift will be passed on to another family in need. I'm in love with Heifer International, and have been for a very long time. My mother has been known to gift me with a share of an animal, or a flock of fowl each year. I once spent the night in a replicated barrio in the Global Village at Heifer Ranch. The work that Heifer does to end world hunger is nothing short of incredible. My Bees and I want to share the love. We're giving away another bunch of bees! Leave me a comment and tell me one thing you're thankful for this year. Or, even better, leave me your favorite idea for something we can do as a family to enrich the lives of others. Just one comment and you are entered to win a whole hive. I will donate to Heifer on your behalf, and send you an Honor Card with your name, or the name of someone you'd like to honor, on it. There is so much to be thankful for, I am glad to be passing along the gift. I love this! What a great idea!! I am so thankful for the love of Jesus...and my wonderful kids and husband to share my life with. 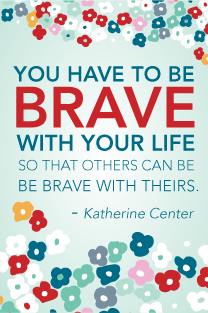 You are wonderful at shining light and love into people's lives! Thanks for being a great friend! I'm thankful for you! Love love love. I should see if they do Monkeys. I'm thankful for my Brother. I'm older, yet he's often protective of me. We've always been close but knowng the other was able to understand some of the tough times, we became closer. We share the same mannerisms, we have the same chin, we have nonsensical jokes that send us to hysterics. He's the life of the party, and incredibly kind. He's my brother, and not a moment goes by that I'm not thankful for him.